The Lenovo Yoga 10 Tablet is quite an affordable yet very powerful Android tablet and a lot better than iPad for nearly half the price tag. Currently, the Yoga 10″ tablet is selling handsomely at Amazon at a discount price (see details). You can also read customer reviews about this tablet by clicking here. You can continue reading this article to know more about this 10″ tablet by Lenovo. 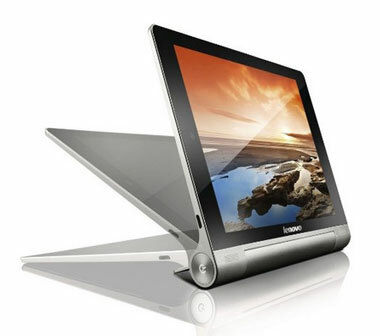 Yoga 10″ Tablet Appearance : The Yoga 10 tablet by Lenovo is not a typical looking 10-inch tablet. It runs Android 4.2 Jelly Bean OS out o the box. It has a featured design that you will not find in any other Android tablet of similar size. The tablet’s handy multimode design allows you to conveniently hold it or sit back and enjoy the content while the yoga 10 tablet rests on its stand. The display has 1280 x 800 resolution and is precisely 10.1″ wide. It is the popular IPS display. Processor & Storage : The Yoga 10 tablet like many other mid to high-end tablets is powered by a quad core CPU rated at 1.2GHz along with 1GB DDR2 memory. The tablet has 16GB of flash storage plus you can insert up to 32GB of microSD card to extend your storage. Cameras & Multimedia : The Lenovo Yoga 10 tablet runs all multimedia applications without any hiccups thanks to quad core CPU and GPU. This 10 inch tablet has a 5MP rear facing and a 1.6MP front facing camera. Thanks to the 720p display, streaming and watching HD content on Lenovo Yoga tablet is great joy. The Yoga tablet is fully capable of streaming 1080p content as well. As far as the battery is concerned, the Yoga 10 tablet beats all the other high end tablets. It will last up to 18 hours, thanks to its unique design, the Lenovo Yoga tablet has more capacity for storing battery charge than other tablets. The tablet has WiFi and GPS as well. By now you must have realized that Lenovo 10 tablet is a clear winner as compared to those high-end and over priced Android tablets. Currently, the Lenovo Yoga 10″ tablet is available at Amazon (see details). You can also check out customer feedback about this very tablet by clicking here.